As much as the opening ceremonies of the Beijing Olympics were a fantastic and had spectators in awe, this story will most certainly put a dark cloud upon the games. A knife wielding Chinese man stabbed to death an American man and injured two others who was attending the Olympic Games. With an unprecedented amount of police and military presence at the Beijing Olympics, it just goes to show even a totalitarian dictatorship like China that random acts of violence cannot be prevented. BEIJING, China (CNN) — A Chinese attacker stabbed two Americans, killing the man and wounding the woman, who were attending the Olympic Games on Saturday, according to the U.S. Olympic Committee. The man also injured a female Chinese tour guide before leaping to his death around noon from the second floor of the Drum Tower, a popular Beijing tourist site, the official Chinese news agency Xinhua reported. The USOC said the two Americans were family members of a coach for the U.S. men’s indoor volleyball team. No other information about them was released. One American tourist has been murdered and another was injured in Beijing, China while sightseeing at Beijing’s Drum Tower at mid-day today. The two Americans who were attacked were relatives of a coach for the U.S. Olympic men’s volleyball team. The suspect has been identified as 47 year old Tang Yongming from Hangzhou. 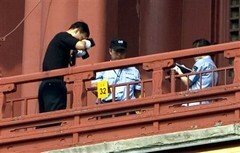 According to reports, after he attacked the two Americans with a knife, Tang Yongming committed suicide by jumping off the Drum Tower. Todd and Barbara Bachman of Lakeville, Minnesota were attacked at the Drum Tower, an ancient monument in downtown Beijing, the IOC and Chinese authorities said. Barbara Bachman’s injuries are “serious and life-threatening,” an IOC statement said. The tour guide’s condition was not immediately clear. Todd Bachman was the father-in-law of U.S. Olympic men’s indoor volleyball head coach Hugh McCutcheon. McCutcheon’s wife, 2004 U.S. Olympic women’s indoor volleyball player Elisabeth Bachman McCutcheon, was with her parents when they were attacked, but she was not hurt, the IOC said. Father Todd Bachman was murdered and mother Barbara Bachmna is in critical condition. God bless this family and may Barbara have a safe ans speedy recovery. All over a game of VOLLEYBALL? Sad story to overshadow a country’s coming out party. This could have happened anywhere in the world and you couldn’t do anything about it. This proves that there are crazies out there in every country in the world. Tell me this doesn’t happen in Watts or the South Side of Chicago on an hourly basis. This is too bad. This guy was a businessman here in the Twin Cities that sells gardening stuff. I know a member of his family and have had cocktails with the person in the last six months. These people ran a very well-liked business in the Twin Cities and were nice people. Unfortunately, in a country of 1.2 billion there are going to be some mentally unstable wackos. This is really sad. Not so good news. I just hope the crazy dude is not linked to Al Kaeda (excuse my spelling, I don’t know how it’s spelled). The Chinese were asked to curb emissions during the Games, and Americans are the worst polluters ever in the entire history of our Earth, hnece the cry “Death to America”. The deed was was perhaps misguided, somewhat overwrought, maybe, taken a tad too literally, but remains the desperate act of a passionate flower child speaking for the endangered global masses: stop the oil wars, Bushitler. less on …yeaH, your really funny. Even your name speaks volumes…less…all lower case and speaks of your internal image,so much less than low level animals. on…again lower case (do you collect pieces of your victims)? Or are you to trite? less on is the product of false information pollution. You cowering scuz, stick to your bong smoking and stay away from the computer. Save your anti american rhetoric for your lowlife anti establishment bong sessions with your unequivocally ignorant paranoid freak conspiracy moronic buddies. Your presence in our society disgraces this poor family. Move to China and cry about the U.S. and save us from your personal freak show.